MODEL AS MUSE: Susan L. Taylor posed for Ramsay's "The Head" back in the 70s. What made Ken Ramsay such a bonafide original? A combination of factors: his unique sense of style, his artistic eye and that meticulous approach to his craft. Above all, though, the late lensman and man-about-town distinguished himself as a gent of substance who sought to hold up a mirror to society through his work. And he succeeded brilliantly. That was the overwhelming consensus at a Redbones-hosted career retrospective showcasing the most iconic images from the Ramsay oeuvre - a thoughtful celebration of the work and vision of a stalwart, giving attendees an opportunity to share in his spirit of excellence. Some 25 pieces made the cut, alluring in composition and arresting in their depth of focus. A team of relatives and associates had the arduous task of making the final selections. Ramsay's nephew, Tony Bailey, took the lead. "He was first and foremost a Jamaican who wanted to tell the story of Jamaica. The whole idea of 'Out of Many, One People,' and you see it represented in his work," Bailey says. "I think he was one of the first Jamaican artists to really reflect the coming-of-age of Jamaica at the time when Jamaica was becoming a newly independent country." 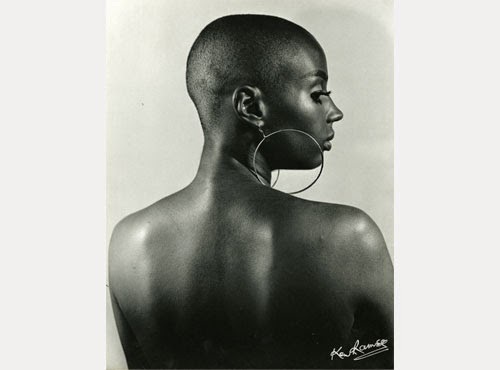 The exhibition's bounty is full of strong and soulful photographs that play with space and light but none more so than "The Head," a shot of a young Susan L. Taylor in profile, a large hoop dangling from her ear. "I think essentially what he wanted to do was show that Black is absolutely beautiful," Bailey testifies. "It's a photo of a young Black woman in all her glory but when the photo first appeared it took on such a deeper universal meaning." "His work is very unique. I've never come across the kind of portraits he takes anywhere else," says Eric Ramsay, a US-based nephew and physicist. Clyde McKenzie is in total agreement. "There's a reason the name Ramsay looms large in the field of Jamaican art," he says. "Ken Ramsay had a remarkable creative force and you see it reflected in the works here. He was a man able to say a lot with very little." For dear friend Howard Hamilton, who gave a heartfelt reflection at Thursday's opening, Ken Ramsay's memory lives on for reasons too numerous to mention and his many lives (artist, war veteran, cab driver, to name only a few) still inspire amusing anecdotes. "He was indeed a man of style and substance and he epitomized both," the legal luminary recalls. "Knowing him was an experience I'll always cherish."